SongsThanksgiving is right around the corner. A special time spent with family and friends, as we all sit down together to enjoy a large feast. But it is also time to reflect on the things in our lives that we should be thankful for. Whether we are thankful for our health, good fortune in our lives, or being grateful to have a steady income, we should all try to find something that makes us feel blessed. There is a song that David Archuleta sings that expresses how fortunate he feels about a few things in his own life. 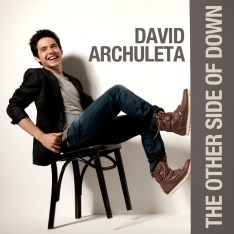 It is a song he co-wrote for his self-titled debut album, David Archuleta. In the song he sings about some of the rough times in his life. Days when his voice was not there for him because of vocal paralysis. Times when he felt as though a career in music might not happen at all. But it did happen, everything worked out and I am sure David is thankful about that everyday! 😉 So my song for this week is about how thankful David seems because everything worked out for him afterall. Did you guess it? “Works For Me!”was co-written by David Archuleta, Daniel Bedingfield and Toby Lightman for David’s self-titled debut album released on November 11, 2008 in the United States by Jive Records. However, it was only available on the CDs purchased at Wal-Mart. “Works For Me!” is an upbeat song, in which David sings about a time in his life when things were a bit unsure. Days when he was concerned about not being able to find a song or use his voice to sing it. Days when he wasn’t certain people believed in him. But in the end, everything worked out fine. Not only did he find his voice, but he has been able to use it to attain his dream of singing. Yes, it all worked out for David. Luckily for us fans, he was able to overcome some obstacles and keep singing and entertaining all of us. For that I am sure he is thankful and I am thankful as well, because listening to David sing is something I truly enjoy. I want to wish everyone a very Happy Thanksgiving! May we be reminded of all that we have to be thankful for, as we celebrate on Thursday with our family and friends. Thanks for choosing “Works for Me”! I love this Motown-sounding tune with its syncopated beat. And I loved seeing David perform it in Reno last March. When he sings, “I can’t decide between the left side or the right,” he spins left, then right.